Find out everything you need to know on the new Jaguar Xe from independent vehicle review website Car And Driving. You can watch the video review to the left to see more of the car or read their written review below to get a true insight from an expert in the automotive industry. Jaguar's XE has been tasked with selling in bigger numbers than any Jaguar before it. Jonathan Crouch assesses this improved version's chances in a compact executive sector packed with talent. The Jaguar XE delivers a slickly executed take on the compact executive genre, offering something different to the usual German suspects. There's now a decent range of petrol and diesel engines to choose from, plus a choice of front and four wheel drive options. The entry-level diesel boasts a sub-100g/km emissions and the flagship supercharged petrol S version packs a 380PS punch. Plus there's the option of cutting-edge connectivity. In short, it's a strong package. 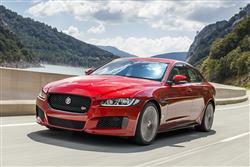 The XE, says Jaguar 'changes everything'. It's certainly the most advanced, efficient and refined sports saloon the brand has ever built, a compact executive model that offers a really credible alternative to that 3 Series, C-Class or A4 you might have been considering. From its aluminium architecture to its frugal Ingenium engines and the purpose-built Wolverhampton factory that builds them, there's a 'clean sheet' feel to this design underpinned by the £2 billion-worth of investment that's been poured into it. Everything, in other words, is very different to what we were given the last time Jaguar entered this segment back in 2001 with the ill-fated X-TYPE. Forget that model though, for this is a very different car, a proper Jaguar and a proper challenger to the Germans in this class that comes to market with a very clear objective: to return its brand to the forefront of this sector, the position it enjoyed with the iconic MK II model back in the Sixties. That's a lot to ask. Can this car deliver? When you compete in the same class as the BMW 3 Series, it's a measure of real confidence to bill your contender as "the driver's car in the global mid-size saloon segment". Yet that's exactly what Jaguar has done and a closer look at the XE reveals the reasons behind their bullishness. The chassis is a 75% aluminium monocoque, light but immensely strong. The clean sheet design utilises a classically correct longitudinal engine and rear-wheel drive architecture. More of the right stuff comes with a slick double wishbone front suspension with room for an extra set of driveshafts when the inevitable all-wheel drive versions appear. Jaguar promises the best electric power steering in class and plenty of chassis goodies like torque vectoring by braking. Most buyers choose one of the 2.0-litre four cylinder 'Ingenium' engines, with the majority of sales focused on diesel power. Most popular are the single-turbo diesels, developing either 163 or 180PS. There's also a pokier twin turbo 240PS version of this unit and, provided you avoid the base 163PS model, you'll be offered the option of AWD. The key more recent change to the XE line-up though, has centred on the introduction of Ingenium 2.0-litre petrol power, buyers offered either 200PS, 250PS or 300PS versions of this relatively efficient powerplant. With the pokier versions, there's an AWD option. The flagship powerplant is the all-aluminium supercharged 3.0-litre V6 from the F-TYPE sports car. Now rated at 380PS, this engine provides the XE S with some senior acceleration, 62mph arriving in around 5 seconds, while top speed is electronically-limited to 155mph. Six-speed manual gearboxes are standard for diesels, while petrol models get an excellent ZF eight-speed auto, which van be optioned onto the diesel variants. The XE conforms to much the same design language forged by the XF in 2007. This bold step freed the company up to move forward confidently, spawning the magnificent XJ and F-TYPE shapes. In many respects, the XE does look like a Russian doll miniature of the XF, a tactic already profitably exploited by its key German rivals. That means an aggressive grille, a strongly-sculpted bonnet, a steeply raked windscreen and a fluid window line. The result is a car that cleaves the air like no Jaguar before, registering a phenomenally low 0.26 drag coefficient. The interior is more spacious than the coupe-like profile would suggest. There's that typically Jaguar enveloping feel to the front of the cabin, with an eight-inch touchscreen taking pride of place and the option of an even more sophisticated 10.2-inch InControl Touch Pro screen if you want it. This can be ordered with 'Dual View' technology allowing driver and frnt seat passenger to view different things at the same time. Also optional is a 12.3-inch TFT virtual instrument cluster. Automatic cars get the brand's trademark rotary controller. The rear seats can be optionally heated and offer a 40:20:40 split-fold - a first for Jaguar - and a through-loading feature. Prices start at a little under £27,000 for the 200PS petrol entry-level SE, with Prestige, Portfolio, R-Sport and S trims also offered. Go diesel as most buyers will and you'll be looking at almost £30,000 for a 163PS SE, with the 180PS models only around £500 more expensive. As for the pokier petrol models, well the 250PS 2.0i variant starts in R-Sport guise at around £33,500, while the supercharged 3.0-litre S is priced at around £48,000. As for equipment, well even the entry-level model gets features like satellite navigation, cruise control, 17-inch alloy wheels, DAB digital radio and a multifunction leather steering wheel. All manner of options, from stereo camera road sign recognition to blind spot monitoring and radar adaptive cruise control, can be fitted. There's self-parking, a laser head up display and perhaps the most intriguing feature of all, All Surface Progress Control. This traction management system comes into its own on snow-covered driveways and ungritted winter roads - and even wet grass. It works with the ZF auto gearbox and functions between 2mph and 19mph, activated by the cruise control switches on the steering wheel. Having set the desired speed, the driver concentrates on steering - the car takes care of the rest, ensuring smooth progress without skidding and without the driver touching the pedals. As for safety, an 'Autonomous Emergency Braking system is standard across the range. All manner of refinements have helped to produce exemplary emissions and economy figures. The lightweight chassis, the compact and light engines, the excellent aerodynamics and engine ancillaries that promote efficiency all contribute to the cause. There's also an electric power steering system that reduces emissions by two per cent on diesel models and three per cent on petrol cars. When it comes to the models on offer, the standout performer is clearly the 163PS diesel car, which emits just 99g/km - or, to put it another way, less than an entry-level Renault Twingo. The combined fuel consumption figure for this XE is an amazing 75mpg. Move up to the 180PS version of this engine and the figures are still very competitive - 109g/km of CO2 and 67.3mpg whether you opt for manual or automatic transmission. On to the automatic-only petrol models. Choose the 2.0-litre engine and whether you order it with 200 or 250PS, you should manage 45.1mpg on the combined cycle and 144g/km of CO2. The 3.0-litre petrol 380PS S variant manages 34.9mpg and 194g/km. When it comes to insurance ratings and residual value data, Jaguar also seems to think the numbers will work in its favour. The Jaguar XE has proved to be everything the old X-TYPE wasn't; bold, innovative, forward-thinking and able to level with the class best. The British brand's on a roll right now and this compact executive saloon is continuing that form line. What's most encouraging about the XE is that despite chasing some bigger sales, the car hasn't sold out on Jaguar's design philosophy. If anything, it just serves to reinforce the fact that lithe, taut and progressive looks can indeed work in a more truncated body. BMW, Mercedes and Audi have had it too easy for too long. With the XE, Jaguar is gatecrashing the party in style.